When you start blogging its a good idea to put the word out and let people know your new blog exists, one way to do this is get listed in online blog directories. Some directories charge a fee to review your blog, which help pay for the upkeep of the directory and also helps to ensure quality listings. 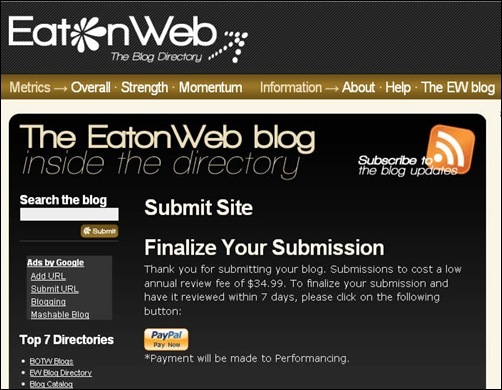 The EatonWeb directory charges a review fee, but blogger BEWARE! 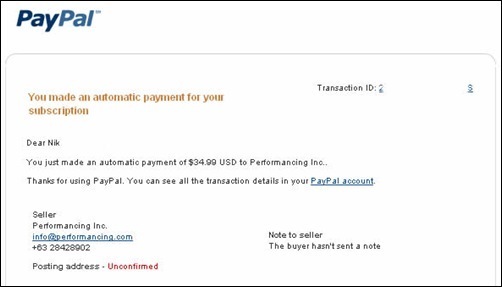 The other day I had an email out-of-the-blue from PayPal saying I’d made an automatic payment for a subscription I’d set-up. First I thought it was just SPAM. I didn’t recall ever setting up a subscription using PayPal, but reading the invoice from PayPal, it turns out that I had been duped into signing up to a recurring annual subscription fee to EatonWeb blog directory, when at the time I assumed it was a one-off fee to list my blog! What’s even worse is the fact I never got my blog listed! Looking at the EatonWeb submission page (below), it’s not very clear that you are signing up to a recurring annual subscription either, or whether you pay the annual subscription whether they list you or not. There are no website terms and conditions and after emailing EatonWeb about this issue I’ve had no reply whatsoever, so I thought I write this post to alert other bloggers to this dodgy practice. My advice is to avoid The EatonWeb blog directory! I previously created a jQuery Blogger Template Category List Widget to retrieve blog categories from a Blogger.com RSS feed and create a list of links which click through to Blogger label pages. I've now taken this code a step further and modified it to calculate the number of times each category/tag occurs enabling me to create a tag cloud from the data, like the one below. Before I explain the code I wrote to make the tag cloud I'll go through the solution to a bug I found with the original categories code. You may recall this snippet of code where I iterate through each post and then each category of each post, finally, when all the categories have been added to the array I sort them prior to de-duping them. I later refactored the code removing the $(data).find('item').each iteration which wasn't required since find('category') will find them all anyway. But I needed a way to store, not only the tag name, but the number of times that tag is used on the blog (the number of times the category appears in the feed). For this I decided to use a multi-dimensional array which would essentially store the data in a grid fashion e.g. The de-dup loop from my previous categories script now performs two jobs, it removes the tag duplicates and creates a count of each tag occurrence. Once the multi-dimensional array has been populated, all that's left to do is iterate through the array creating the HTML necessary to build the tag cloud, followed by appending it to a DIV tag with an ID="bloggerCloud" on the page. Note the calculation I perform to get the tags appearing a reasonable pixel size ((tagCount * 3) + 12). Since building this script I've now gone one step further and created a jQuery plug-in based on this code. For more details and the source code see my jQuery Blogger.com Tag Cloud Plugin page. Blogger is a hosted blogging service which allows you to publish your blog to your own URL and create your own custom HTML templates to match your website design. I have been using Blogger for this blog for several years, and have been trying to find a good way of displaying a list of categories on each blog page. As yet I haven't found an official way of creating a category list using the Blogger mark-up code, so I decided to write my own widget to do the job for me. When I say category list I mean a list of all the blog tags/labels in your blog, each linking to a page with posts categorised using that particular tag, just like the examples below. Thankfully the Blogger service publishes XML files to your website along with the post, archive and category HTML pages. These are in ATOM and RSS formats and are there primarily for syndication, but XML files are also fairly straight-forward to parse using most programming languages and contain all the category data we need to build a categories list. I chose to use the jQuery library because it makes the process even easier. From the Blogger ATOM XML snippet below you can see that each blog item can have multiple category nodes. This means that the code must loop through each blog post, then loop through each category of each post to create our category list, but it also means that we will have duplicate categories, because more than one post can have the same category. Once it reaches the end of the RSS feed, I need to sort the array into alphabetical order so that I can de-duplicate the categories list I just populated, which is what the next jQuery .each() function does. All I have left to do is loop through the de-duped categories list, create the HTML link for each category and the append the HTML unordered list to the page. The only HTML you need to add to your Blogger template is a call to jQuery, and this script in the head of your page, plus an empty HTML DIV tag, in the place where you want your categories list to appear. You can see the script in action on my blog, or see this code rewritten to create a tag cloud. It seems that Blogger has changed the type of syndication feed they use during the last month (Jan â€“ Feb 2008), I discovered this when my Atom feed XSLT transformation broke when I published my last post. Here's my updated XSLT to convert the new Blogger.com format. I've pretty much finished migrating my personal website from classic ASP to ASP.NET 2.0. In the end I decided to keep certain pages using ASP (Active Server Pages) technology (more on that in a moment), the majority of the pages however have been migrated. While I wanted to bring my site up-to-date I also didn't want to lose too much Google Page Rank in the process, and make people's bookmarks and RSS blog subscriptions stop functioning. The reason the pages have to change URLs is that ASP.NET pages use the extension .aspx, compared to ASP's .asp 3-digit extension. So my portfolio.asp page for example has become portfolio.aspx. My blog area uses Google's Blogger as a CMS, so this area hasn't had to change, although prior to using Blogger I had previously built my own blog engine and this has remained as is. The most popular part of my site is my Cisco CCNA section. Apart from the new menu page, the other pages have half-decent Page Rank and a few pages also have DMOZ entries, so those have had to remain ASP too. All the other pages however have been migrated. When you now visit those old pages (from SERPS or old links) you'll get HTTP 301 redirected to the new ASP.NET pages. Because I'm on a shared server with no access to IIS (Internet Information Server), I essentially had to hard-code ASP 301 redirects on all the ASP pages that have moved, redirecting users to the new versions. The next step in the process was to include those old ASP pages in my robots.txt file and log-in to the Google Webmaster console to expedite the removal of those old pages from the Google index using the URL Removal tool. If you haven't already accessed Webmaster tools I highly recommend you log-in and verify your site. Next, I made sure all navigation menus and links to the old pages under my control were pointing to the new versions. This meant updating my Blogger template and republishing, updating my old ASP navigation include files and crawling my site using XENU link sleuth to check for any I had missed. Moving my content over to ASP.NET has been fairly straight forward due to the small number of pages, my Tools and Portfolio pages display data stored in XML files, so it was just a case of using XmlDataSource controls to pull the information onto the pages. My homepage picks up the latest entries in my Blogger Atom feed using XSLT, and my contact form uses basic ASP.NET form and validation controls. While migrating my content I thought I'd use the caching feature built-in to ASP.NET to allow me to display my latest ma.gnolia bookmarks on my site, so I ended-up creating a Bookmarks page, which fetches my ma.gnolia lite RSS bookmarks XML file, either from ma.gnolia.com or my cache. The cache doesn't hold my data for as long as I stipulate, but I'm assuming this is because I'm on a shared server and the cache is dropping it to free resources. I've been busy recently migrated my homepage (and several others) from classic ASP to ASP.NET. My homepage displays the latest 5 posts with a summary and a link to the full blog post. I eventually found a tutorial using XSLT explaining how to achieve this after discovering that XmlDataSource XPATH doesn't support namespaces! Limit the amount of posts returned by the transformation. Show a summary of the post. Show a summary that tries hard not to cut words in half when generating a snippet. To Feedburn or not to Feedburn? Feedburner not only takes away the hassle of analysing web feed statistics and subscribers, but adds a lot of other functionality too. * I can't redirect any current traffic from my old Blogger Atom feed on my shared Windows hosting as I don't have access to IIS through my control panel. The file is an .xml file, and I can't use .htaccess for obvious reasons. I would need to use an ISAPI rewrite tool I suppose, which I probably wouldn't be able to get installed in a hosted environment. Despite these issues, I've decided that the pros of knowing my subscribers etc out way the cons and I'm now syndicating through Feedburner! I am wondering however, how Feedburner manage to host so many blogs. I assume they have some serious kit to handle the many requests they get. I would be interested to know what the Feedburner IT infrastructure looks like.